Rufus T. Firefly: I danced before Napoleon. No, Napoleon danced before me. As a matter of fact, he danced 200 years before me. Q: What does "Duck Soup" mean? Q: Did Groucho Marx utter a racial epithet in this film? It narrowly beats A Night at the Opera as the best all-round Marx Bros film, though I find the humour more bizarre in Monkey Business. At least the musical numbers in DS are actually worth sitting through. 1) The mirror sequence. The finest comic sequence ever committed to film. Sure, it's old-hat vaudeville, but it's professional, beautifully timed and spirals into wonderful absurdity. 2) The one-liners, puns and other jokes. Pick of the crop are the peanut stall interchange, the telephone sequence, the riddles ('what has four pairs of pants, lives in Philadelphia, and it never rains but it pours?') and the final battle (especially the stock footage of monkeys and elephants running to save the army under siege - the kind of thing the Zucker Bros pinched for their comedies). Oh, yes, and the motorcycle routines. 3) The satire on politics and warmongering. The Brothers simply deflate the pomposity of the whole deal. 4) The fact that Zeppo is actually given something to do. 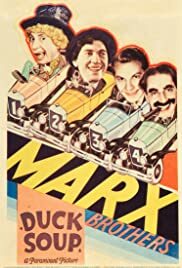 Anybody who thinks the Farrelly brothers are the last word in comedy should be strapped to a chair and shown Marx Bros films over and over again, until they concede. 70 of 86 people found this review helpful. Was this review helpful to you?